There's a constantly-growing selection of Doctor Who-based graphic novels (or "comic books" if you prefer, since the term is a little controversial among comics fans). During the 80s and 90s, only a handful were produced — but starting in 2004, Panini published a roughly twice-yearly series of graphic novels, reprinting restored versions of comic strips from various eras of Doctor Who Magazine. Also, between 2008 and 2013, US publisher Idea & Design Works (IDW) published two separate series of Doctor Who graphic novels, one containing brand new Doctor Who strips, and one reprinting classic Doctor Who Magazine strips, for example Agent Provocateur and Doctor Who Classics: Vol 1. 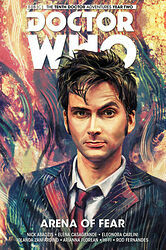 Titan Books took over IDW's Doctor Who comic licence at the start of 2014, with the publication of graphic novels resuming in 2015. Note: This section only lists graphic novels that have literally been published as books (i.e. with a paperback-style cover/binding and an ISBN) — not magazine anthologies, of which there have been several over the years, such as 1994's The Age of Chaos and The Dalek Chronicles, which being "magazine specials" were sold on magazine shelves and without an ISBN number. Pictures of many of these "magazine specials" can be found at Tony's Trading site. Finally, there are a small number of other books which are entirely comprised of comic-book content, but they're not "novels" in the sense of having a coherent narrative, so are not included in this section. These are: The Doctor Who Fun Book, It's Bigger on the Inside!, It's Even Bigger on the Inside, The TARDIS Tales Treasury and Whoah! Eight Years of Bizarre Cartoons from the Pages of Doctor Who Magazine.